This post is the 2nd part in a 2 part series. 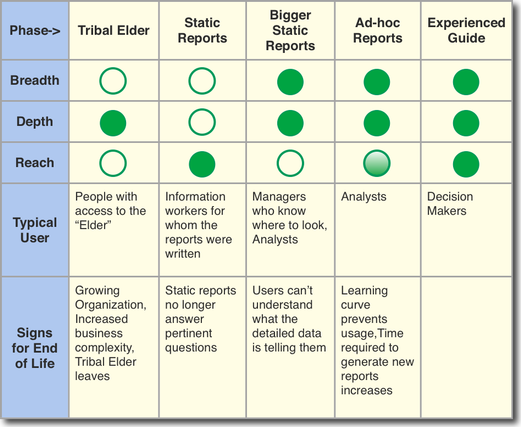 Last time we talked about how organizations use Tribal Elders and Static Reports to find answers to questions that they already know. Today we’ll talk about the other three phases of Data Analytics Maturation. Once the organization realizes that they need answers to questions that they don’t yet know, they start to extract all sorts of permutations on all of the data that they have and distribute those reports to the "need to knows" on a regularly scheduled basis. In most cases, an analytics team is set up to manage the requests from the business for more or different information. Sometimes the reports are modified, but many times new reports are created because the users already know how to use the old reports. The analytics team works hard to maintain the information flow to the individual requests with the intent to provide all the information that would ever be needed by the consumers. The down side is that this typically manifests itself in the form of the dreaded 124 page monthly report. So, the reporting "Oracle of Delphi" shows up in the inbox. For a little while there’s some excitement along the lines of "I never knew we could get all this information." However, soon folks realize that interpreting the data for "questions you don’t know" turns out to be pretty difficult and once they figure out where are the answers to the questions they know, they just look at those few rows of the report and leave the rest for analysis "later" (which probably means it ends up in the recycle bin... if we’re lucky). Phase 4 begins when a few folks who get the 124 page data dump realize "if I could just filter the data down a little I could much better understand the answers to this specific question". So the organization provides the ability for end users create ad-hoc reports. Now the user has the ability to construct their own custom reports to answer the specific and unique questions they have about their data. Sadly enough, however, most people who need to know the answers get stuck in any of a few traps down in the weeds. The first trap is that they may be sure they know what questions to ask, but even in spite of their confidence, they’re really asking the wrong ones. Secondly, most people in this situation are more business oriented and less technical (presumably the more technical ones have already figured out how to query the data directly). In all but a few cases, the tool that is provided requires too much technical expertise for most business people to overcome in order to be really productive. Thirdly, even if they can actually get to the data that really does help them to be more productive, they lack the analytical expertise to interpret the data and turn it into usable information. The end result of these three hurdles is that the users end up either in analysis paralysis, or just plain giving up. To solve the barriers presented by having a lot of data available only to technical users, maturing organizations provide solutions targeted at specific business areas that make exploration accessible to those who can impact business performance (in other words, everyone involved in the workflow). These solutions are not about the technology or even the data, but rather about providing information that translates easily in to getting stuff done. The results are provided in a fashion that makes access to the right information easy by guiding the user through a process to help them answer the known questions, discover new questions to ask, and explore answers to these questions. It’s sort of like the guide you might hire on a photo safari. The experienced guide will make sure you find the animals that you came to see in the first place, but will also point out really interesting things along the way that you had never thought of. And you might even discover something amazing and exciting that you didn’t even know existed. Good information tools are just like an experienced safari guide. The sad part about "experienced guide" information tools is that there are so few that exist. The good news is that we see more and more information workers and decision makers "seeing the light" when it comes to understanding their need for these sorts of tools. And, we believe that as more and more organizations mature and experience the challenges of the first 4 Phases of Analytics Maturation that more and more will see the benefits of Phase 5, and implement solutions that help us all be more effective and efficient users of information.